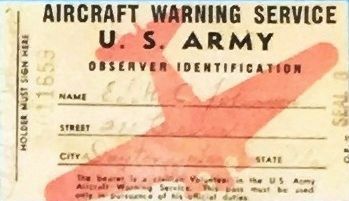 Following the Japanese attack on Pearl Harbor December 7, 1941, the American government placed a high priority on Civil Defense throughout the Second World War. 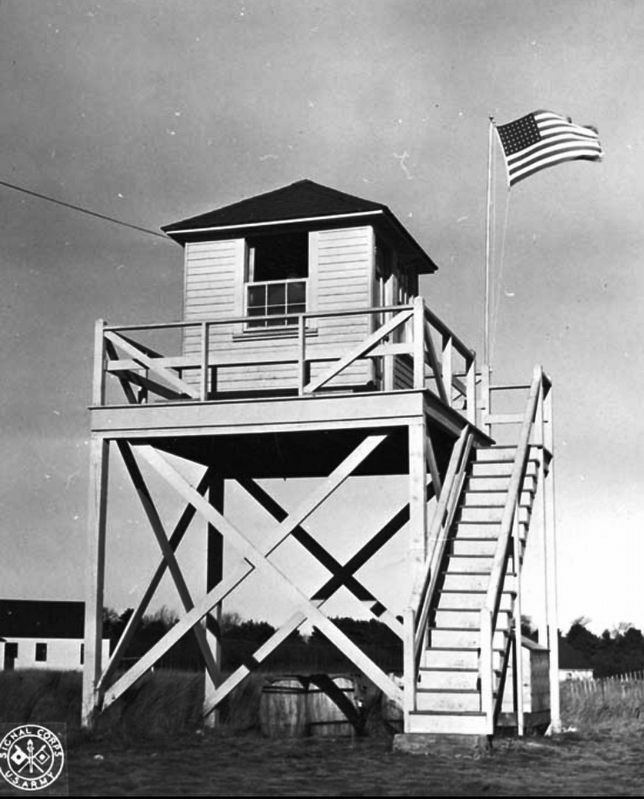 This coastal watch tower was constructed and staffed by civilian volunteer “spotters” who were part of the Ground Observation Corps, the Army Air Forces Aircraft Warning Service/Civil Air Patrol and the Coast Guard Auxiliary. 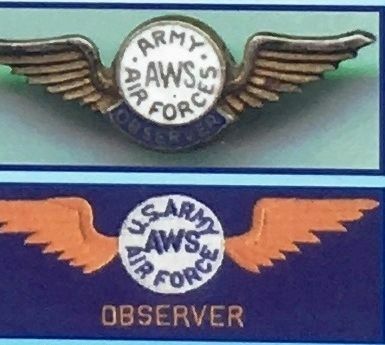 Armed only with binoculars and a telephone, they monitored the skies for air traffic and reported any flight plans. 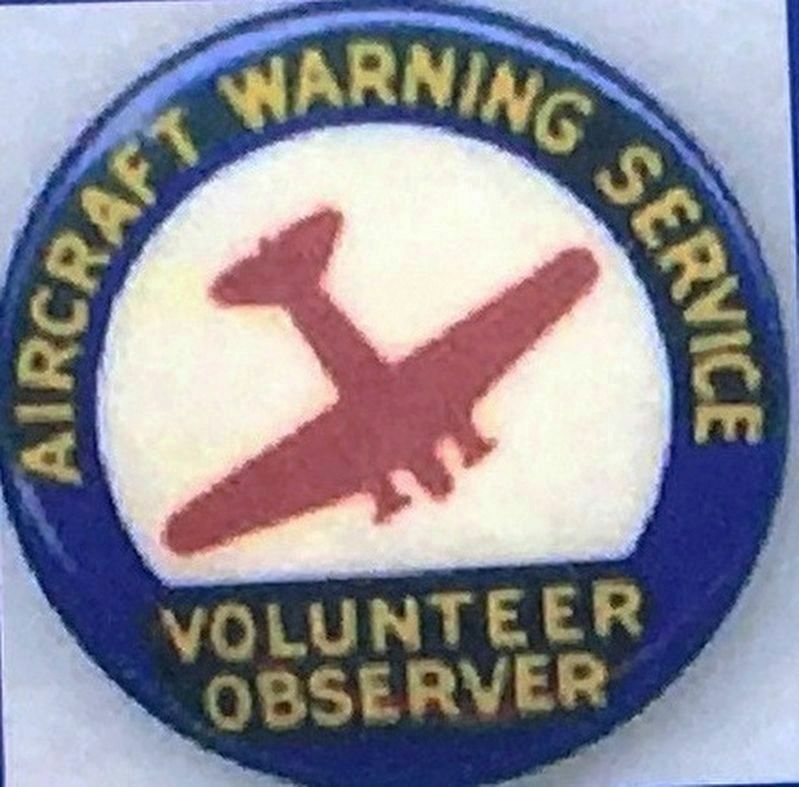 Spotters also watched for signs of German U-boats that operated just off shore, sinking merchant marine vessels in an attempt to disrupt the American war effort. 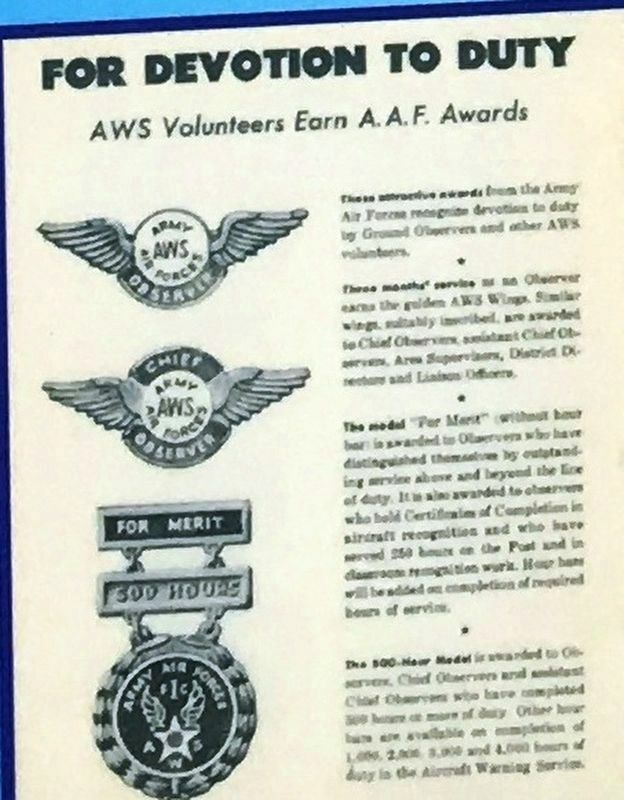 civil defense network provided an important avenue of involvement for many on the home front as well as an esprit de corps for civilians facing the many material and emotional difficulties that life in wartime America created. Few towers survived after the war and this is one of the last remaining in Florida. It stands as a monument to the civilian men and women who served their country in her hour of need. 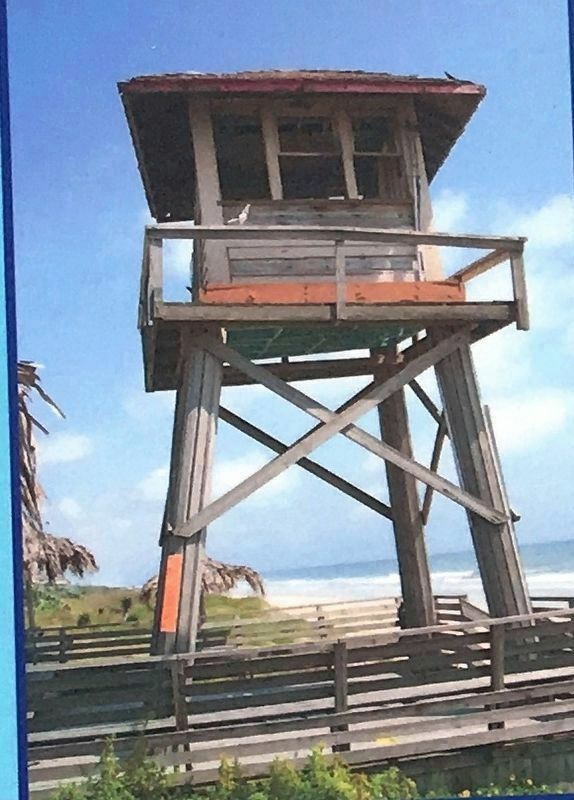 Dedicated on this 7th day of December, 2004, by The Emmer Group with special thanks to the County of Volusia and the Ormond Beach Historical Trust Inc.
Erected 2004 by The Emmer Group and Volusia County. Location. 29° 20.817′ N, 81° 3.91′ W. Marker is in Ormond Beach, Florida, in Volusia County. Marker is on Ocean Shore Boulevard (State Road A1A) 0.1 miles north of Spanish Waters Drive, on the right when traveling north. Touch for map. Marker is at or near this postal address: 2177 Ocean Shore Blvd, Ormond Beach FL 32176, United States of America. Touch for directions. (approx. 4.1 miles away); The Casements (approx. 4.2 miles away); Joseph Downing Price (approx. 4.3 miles away); John Andrew Bostrom (approx. 4.3 miles away). 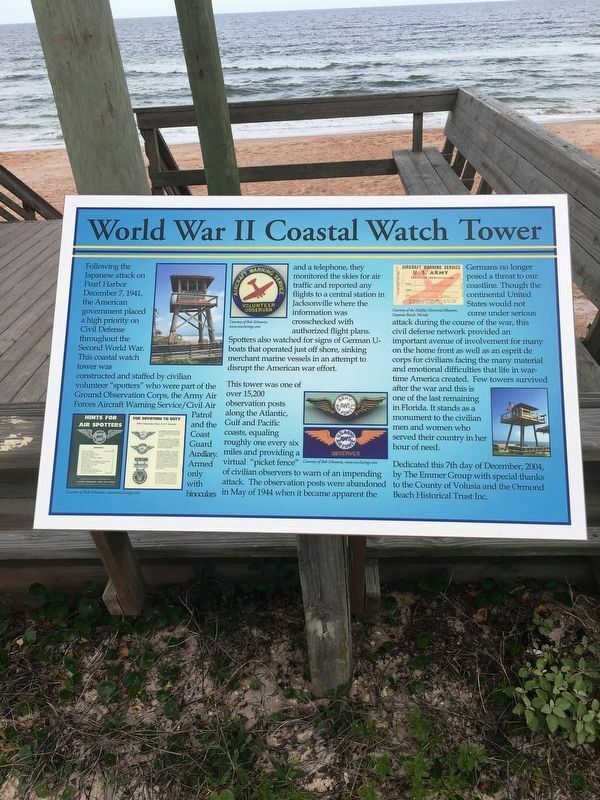 Touch for a list and map of all markers in Ormond Beach. More. 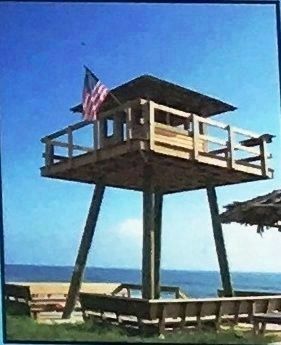 Search the internet for World War II Coastal Watch Tower. Credits. This page was last revised on March 3, 2019. This page originally submitted on March 2, 2019, by Brandon D Cross of Flagler Beach, Florida. This page has been viewed 64 times since then. 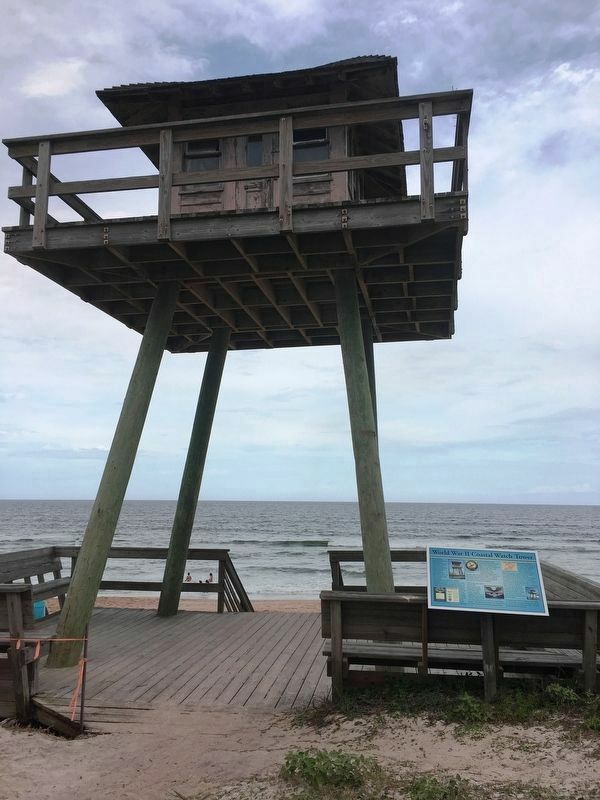 Photos: 1, 2, 3, 4, 5, 6. submitted on March 2, 2019, by Brandon D Cross of Flagler Beach, Florida. 7, 8, 9. submitted on March 3, 2019, by Brandon D Cross of Flagler Beach, Florida. • Bernard Fisher was the editor who published this page.